Hello friends! I know it’s been a while, but I’m back with one of my favorite Arabic recipes that only requires 7 ingredients, 25 minutes, and is perfect for summer! 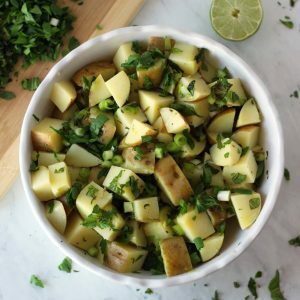 This light Mediterranean potato salad is a refreshing side to bring to summer picnics and parties, and I prefer it so much more to traditional potato salads with mayo-based dressing. 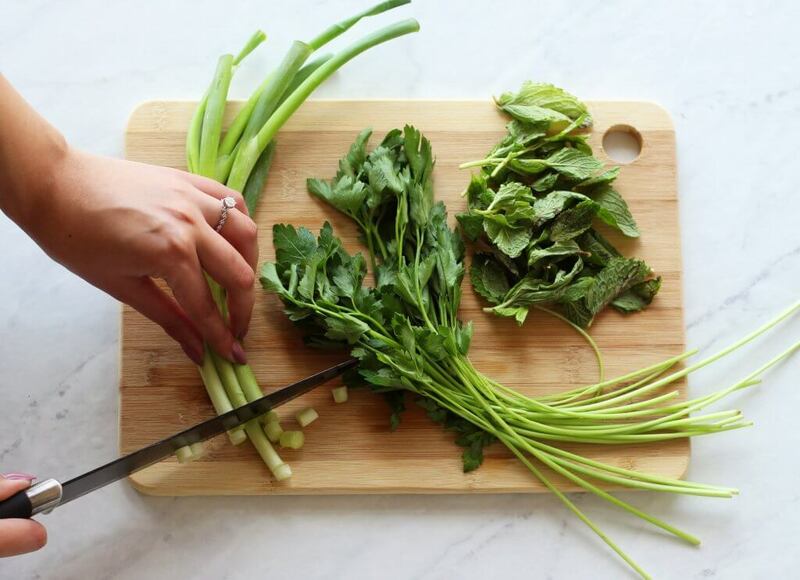 It embodies everything that I love the most about Middle-Eastern cooking- simplicity, whole foods and fresh ingredients, and some of my favorite Mediterranean flavors including mint, parsley, lemon juice, and of course olive oil! 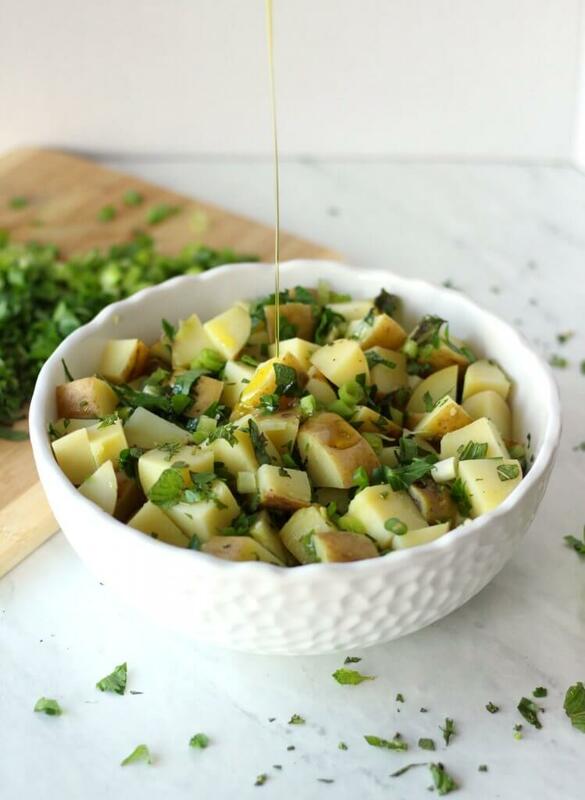 I love to use Yukon gold potatoes because there is no need to peel them and by leaving their skin on, you will get extra fiber and potassium! 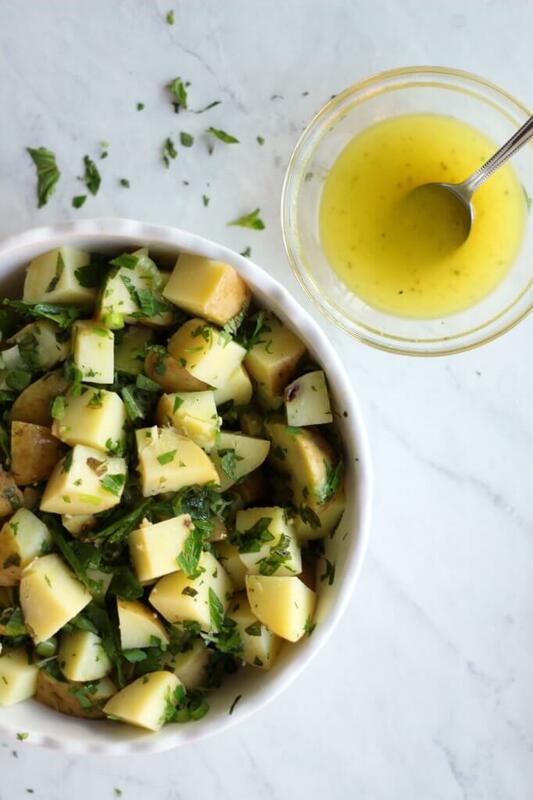 The beauty of tossing the potatoes in an olive oil and lemon-based dressing is that the flavors of fresh herbs and the soft starchy, potatoes will shine through, rather than be overpowered by a creamy sauce. I also attempted a video for this recipe for the first time, and hopefully it is only the first of many to come! I definitely learned a lot and can’t wait to continue trying out new techniques to show you how to make these recipes. I can’t wait for you to try this recipe out, and I hope you love it as much as I do! Don’t forget to pin this recipe for later and tag your recreations on Instagram @zenanzaatar #zenanzaatar! 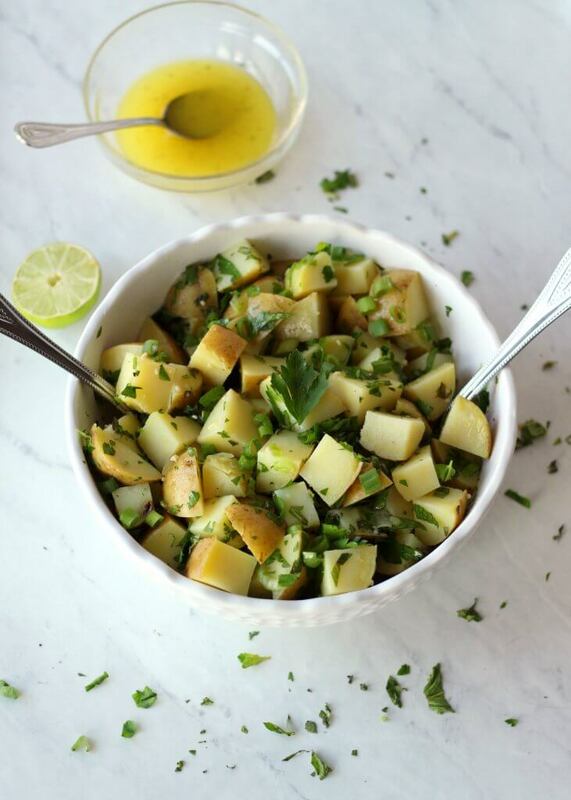 A light, refreshing, and healthy Mediterranean potato salad- the perfect side dish for summer parties and picnics! Wash and scrub potatoes. If using Russet potatoes, peel them as well (Yukon gold or other waxy potatoes do not need to be peeled). Place potatoes in a pot of cold water, and bring them to a boil. Lower heat to medium and simmer for 15-20 mins, until fork-tender and soft. Meanwhile, chop parsley, mint leaves, and spring onions. Combine lemon juice, garlic, olive oil, salt and pepper in a small bowl. Taste to see if you would like more lemon juice or salt. 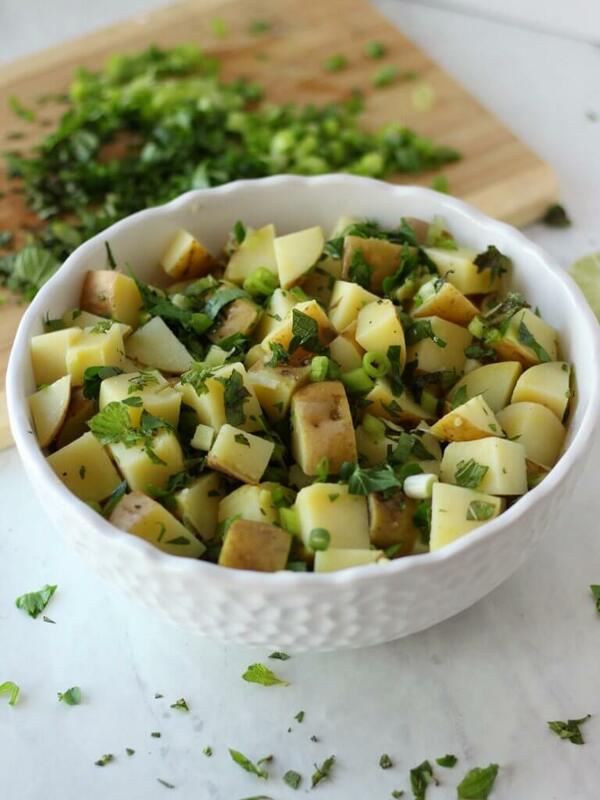 Dice cooked potatoes, and then toss in a large bowl or serving dish with dressing and herbs. Refrigerate before serving if desired, to let the flavors infuse.